Don’t Get Caught by Phishing! Don’t let phishing attempts compromise your network security! Perhaps one of the most common types of cybersecurity breaches is also the easiest to fall victim to. Phishing scams often approach potential victims as links, emails, and pop-ups that at first glance appear perfectly normal or as if they’re coming from friends or loved ones. Fortunately, there are a few simple tips that can help keep you and your workplace Phisher-free. One of the easiest ways to quickly identify a phishing scam is to double check the URL, the email’s sender, and the body text. Keep an eye out for obvious typos, and URLs or email addresses that appear similar to those of friends or common sites. Often Phishers will try to target you by sending emails from addresses that are a letter or two off one that you know. If an email or link seems suspicious, always approach with caution. As annoying as they may be, pop-ups have the potential to be either real or a scam and are an excellent way for phishing attempts to enter your computer as you try to get out of them without paying attention. When a pop-up appears, always pay attention as you try to exit, Often, these types of pop-ups will have a “cancel” button that misdirects you to their website rather than exiting. In general, every computer, especially in a business setting, should be equipped with a base level of firewall and antivirus protection. Not only will these keep the computers running better, but it will ensure that your businesses information remains secure. Is this link necessary? Is it from a trusted source? Is it relevant to what this person might send me? These are just a few of the questions you should ask yourself before you click any link. As we discussed, scams can originate from even trusted email sources so always take a moment to consider before clicking any links. Lastly, stay up-to-date with the common scams. If possible, have an IT person put together a bi-weekly or monthly email with some of the more common attempts so that your entire staff will remain aware. 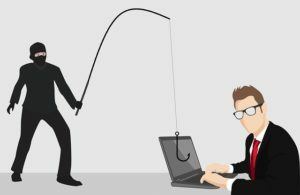 Phishing scams are easy to fall for in part because they evolve so quickly, make sure your company stays safe by staying ahead of the curve! This entry was posted on Friday, September 21st, 2018 at 4:45 pm. Both comments and pings are currently closed.